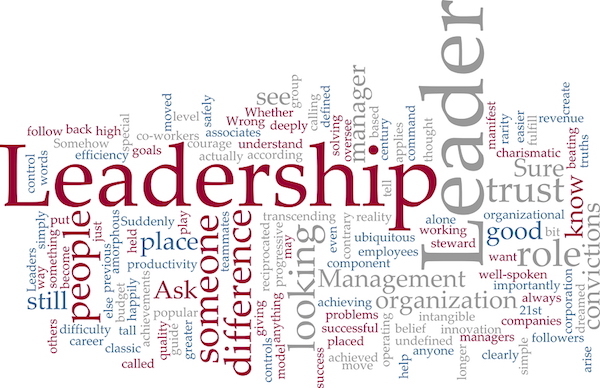 According to Wikipedia leadership defines the practical skill encompassing the ability of an individual to ‘lead’ or guide other individuals, teams, or entire organizations. US academic environments define leadership as ‘a process of social influence in which a person can enlist the aid and support of others in the accomplishment of a common task’. There are many theories about leadership; today the transformational leadership model is probably one of the most commonly applied in our western culture. With this leadership model, leaders set direction and help themselves and others to do the right thing to move forward. To do this they create an inspiring vision, and then motivate and inspire others to reach that vision. They also manage delivery of the vision, either directly or indirectly, and build and coach their teams to make them ever stronger. In contrast, the study of leadership in economics focuses primarily on corporate leaders as managers who obtain worker effort to influence profitability mainly by structuring contracts and incentives in conjunction with performance monitoring. However due to the increasing influence of the research carried out by behavioral economists this view is changing. Leadership is strongly linked to a corporate culture which defines values far beyond the typical elements of balance sheet data such as earnings, growth and profitability. One company culture that has gained momentum as consequence of the internet comes from Start-Ups where mostly young people combine all their energy and knowledge to realize a ‘dream’ producing something which customers find useful. The enormous and much publicized success of a few like Marc Zuckerberg of Facebook, Jeff Bezos of Amazon or Sergey Brin and Larry Page of Google have spurred a Start-Up Industry which includes venture capitalists, crowdfunding platforms, coaches and financial advisors. Prestigious Universities offer Start-Up and Spin-Off support to their students usually in combination with innovations they worked on at the campus. As these companies -if successful- expand and mature, their leaders face the challenge to maintain the Start-Up culture or otherwise transform the company to a more established and possibly less innovative business culture. One remarkable example is Google, already 20 years old with over 60’000 employees worldwide. They make a strong effort to maintain the Start-Up culture, for example with a democratic approach to decision making and low hierarchy levels. They try to support the personal development of their employees by encouraging them to spend one day a week of paid activities not directly related to their job yet useful to society in a larger context. It comes as no surprise that Google continuous to attract the best young talents worldwide. According to Laszlo Bock, since 2006 responsible for HR at Google and author of his new book ‘Work Rules’, transparency and participation are key to Google’s business culture. For example the hiring of new employees involves a multistage process where the decision to hire someone is not just left up to the manager in charge. Intrinsic motivation and the inner drive to contribute are highly rated. In that respect Google also applies a policy of ‘unfair’ compensation paying the heavy contributors a salary which is linked to their contribution and not defined by a corporate salary structure. Some Start-Ups like Uber, Airbnb or Zalando have disrupted traditional business segments and leaders of established companies are pondering over the question how to react to the threat of disruption. ‘Digital Transformation’ has become the buzzword for mature and established companies to avoid being disrupted. Contrary to a Start-Up an established company has customers, products and services acquired over many years. One of their greatest assets is the ‘Data’ related to their business activities. For example, as businesses become more customer-centric they need to better understand customers purchasing behavior. Machine learning and data analytics provide the tools to do that. CEO’s and C-level executives will best exploit Machine Learning if they see it as a tool to craft and implement a strategic vision. But that means putting strategy first. Without strategy as a starting point, Machine learning risks becoming a tool buried inside a company’s routine operations: it will provide a useful service, but its long-term value will probably be limited to an endless repetition of applications such as models for acquiring, stimulating, and retaining customers. The people charged with creating the strategic vision may well have a background in data science. But as they define the problem and the desired outcome of the strategy, they will need guidance from C-level colleagues overseeing other crucial strategic initiatives. More broadly, companies must have two types of people to unleash the potential of machine learning: First quantitative analysts also called ‘Quants’ that are schooled in its language and methods; Second ‘Translators’ that can bridge the disciplines of machine learning, data analytics and decision making by reframing the quants’ complex results as actionable insights that generalist managers can execute. Machine learning will lead to a new era of man–machine collaboration resulting in fundamental changes in the way we work. While the machine identifies patterns, the human translator’s responsibility will be to interpret them for different microsegments and to recommend a course of action. The crafting and formulation of the objectives that such machine learning algorithms attempt to optimize requires a high degree of creativity and emotional intelligence on behalf of the CEO and the C-level team as well. With the arrival of the internet about 20 years ago, companies had to reinvent themselves mainly by realigning their communication structure towards customers and partners. Machine learning leads to machine knowledge and its impact goes far beyond the consequences we saw or still see as the internet penetrates every aspect of our daily lives. It’s true that across the economy as a whole, “creative destruction” has been a constant, since at least 1942, when Joseph Schumpeter coined the term. But for individual organizations and their leaders, disruption is episodic and sufficiently infrequent that most CEOs and top-management teams are more accomplished at running businesses in stable environments than in changing ones. It is likely that Digital Transformation will reduce the number of conventional jobs. However it is also foreseeable that with further advancements in brain research and machine learning coupled with the growth of machine knowledge the complexity to manage a corporation will consistently increase. As paradox as this may sound this trend will have the effect that human resources are likely to become the most valuable asset a company has. The days are gone where human resource management just involved the administration of employment contracts. According to Laszlo Bock, Google spends about twice as much on human resource management compared to other high-tech companies. It could well be that the management of human resources will become a key competitive differentiator in the corporate landscape. It’s time to redefine what human resource management involves and how companies can assure that humans as their most valuable asset can further develop to handle the increasing complexity of their work environment. The spirit to accomplish this ambitious task has to come from the top, it requires leadership.